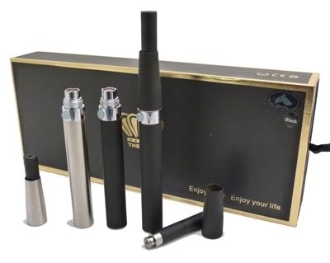 eGo 510 Electronic Cigarette Kit- Whether a beginner or veteran smoker, this is a wonderful kit to have! With its sleek design and large battery, you can have an enjoyable smoking experience!! One of the more popular kits on today's market. It gives off great vapor production little or as much vapor as you would like. An excellent opportunity to save money when you use the e-cigarette with our empty refillable cartridges and our flavored e-liquids! Pre-filled flavored cartridges are also available to choose from. This kit comes with a powerful 650mAh battery, which can support a heavy smokers needs for up to 1 full day when fully charged. eGo 510 electronic cigarette kit color options include: Black, White, Pink and Silver.